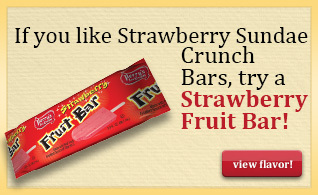 Vanilla ice cream bar with strawberry flavored center and cake crunch. Meets the final rule for competitive foods published by USDA’s Food and Nutrition Service for Nutrition Standards in the National School Lunch and School Breakfast Programs. SKIM MILK, WATER, LIQUID SUGAR, CORN SYRUP, CRUNCH (BLEACHED WHEAT FLOUR, SUGAR, PALM OIL, SALT, BAKING SODA, ARTIFICIAL FLAVOR, SOY LECITHIN, RED 3), COATING (SOYBEAN OIL, PALM OIL, COCONUT OIL, SOY LECITHIN, VANILLIN, CITRIC ACID), WHEY, MALTODEXTRIN, ADIPIC ACID, MONO- AND DIGLYCERIDES, PROPYLENE GLYCOL MONOESTERS, LOCUST BEAN GUM, GUAR GUM, CELLULOSE GUM, CARRAGEENAN, NATURAL FLAVORS, RED 40, VITAMIN A PALMITATE.